Motorhomes, 5 metres long or less. 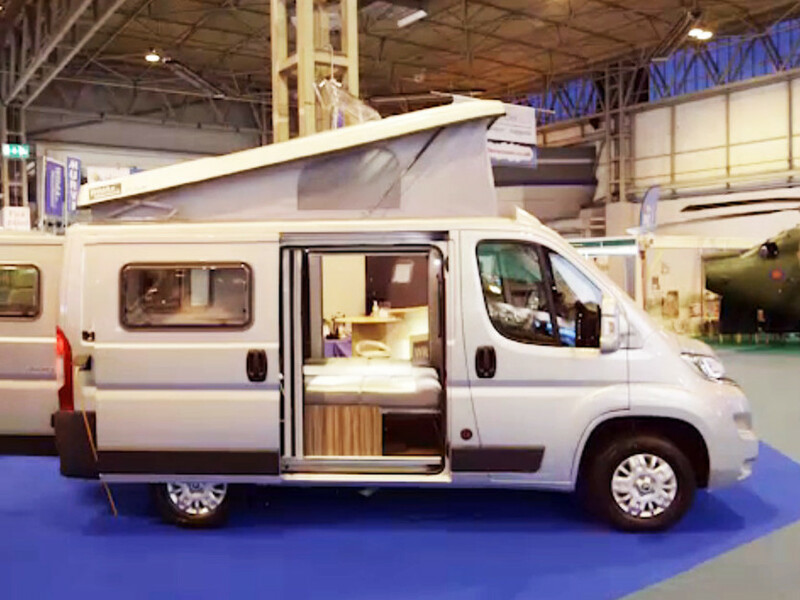 Although we love our NV200 dearly and adore our little customised Freedom caravan, we do enjoy checking out other options which become available. At last, two manufacturers. at least, have come up with sub – 5 metre long motorhomes. It was so busy at the NEC that we did not completely get the full picture of what the Wildax Pulsar and the Devon Firefly can offer. Tomorrow we are visiting Wildax at Halifax for a better look but later we shall have another very close look at the Devon alternative. Wildax Pulsar vs Devon Firefly Hi-top. Putting overall price to one side for the moment. The Citroen Relay based Wildax Pulsar has a lower profile than the Ford Transit Hi-top from Devon. This is due to the pop top roof on the Pulsar. The advantage of the smaller cross sectional area , which the engine has to push through the air and is one of , if not THE, most significant of factors in fuel consumption. This may be offset, however by the added weight of the large, comfy looking roof bed in the pulsar. I will compare vehicle weights to see if this can be confirmed or not. Stop Press! You do not have to have the roof bed if 2 berths are sufficient. The big advantage of a fixed Hi-top roof is reduced noise from the weather in wintery, wet and windy weather. Also, a Pop-Top canvas CAN leak if faulty or poorly stitched. The Pulsar can offer 4 berths against the 2 berths on the Firefly though and in Summer, what’s nicer than sleeping in a well ventilated “tent” on the roof? In the lanes, with a Hi-top, care is needed not to drag the roof through low tree branches. You get used to watching for this but it is a factor in stress free usability.. We would never buy a large overcab motorhome again particularly. Both these short wheelbase motorhomes offer round the clock access to the kitchen facilities and the toilet washroom. The Pulsar has a particularly stylish shower room but I believe that I could fit a shower tray in the Firefly between the toilet unit and the washbasin on the opposite side of the van. A cushioned filler floor board would cater for day to day stomping about. Not sure, at this stage if just a shower curtain would waterproof the surrounding cupboards etc but I will be looking closer. It took 5 leisurely DIY days to make a wetroom in our Microlite caravan , but it functions. A couple of asides. 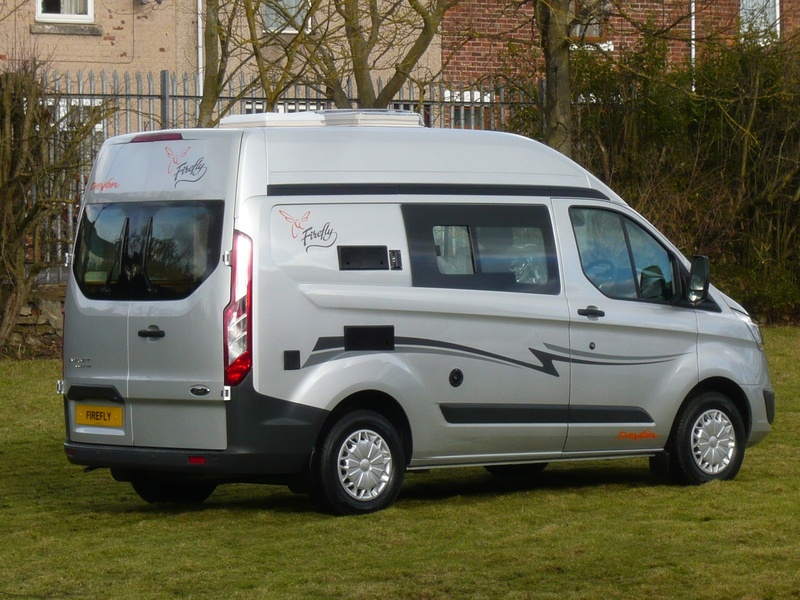 I do consider these RV’s to be motorhomes rather than campervans due to the 24 hour accessibility of all facilities within the van. These sub 5 metre vans offer almost as much as 6 metre plus motorhomes which , from past experience ,can be difficult to park. There are campervans available which have full, 24 hour access to a toilet and some have half height privacy panels but none that I have seen have full shower or washrooms. Unless you know differently? Again, thanks Martin (see next post). At this point, Wildax;s Duncan Wildman, appears to have tapped a significant niche market again !